Ever wonder what to do with all those nutritious beet greens after you're done eating the yummy beets? Beet greens make for the base of a very lovely salad. 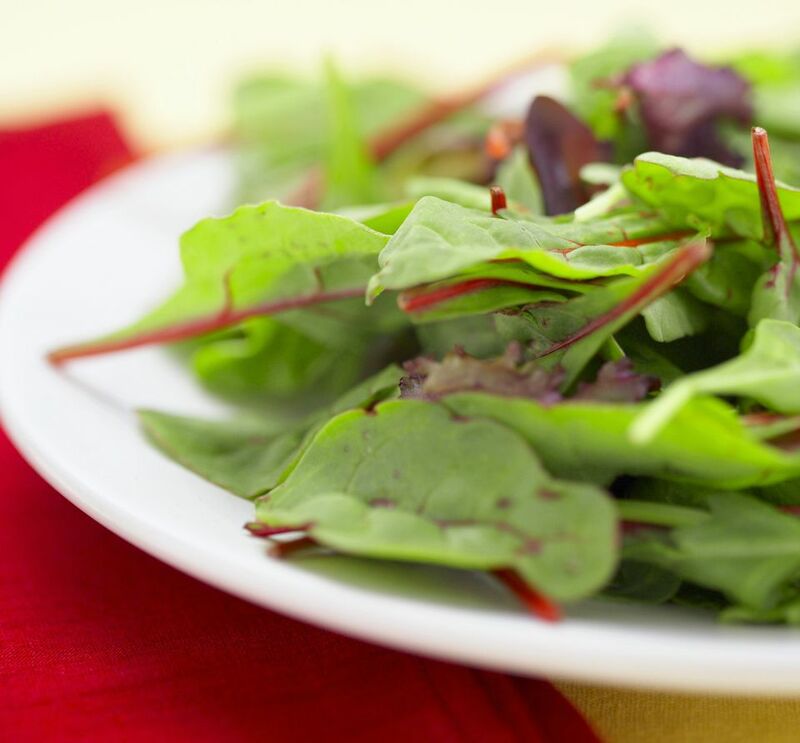 In this recipe, beet greens and fresh herbs come together in and marinate in an all-natural and raw vegan balsamic and mustard vinaigrette salad dressing which is sweetened with a touch of raw agave nectar. When making this beet green salad, If you allow the whole thing to marinate in the dressing for a while, the beet green leaves will soften up and become even more digestible. However, if you find that the taste of beet greens is too bitter for you, then use a blend of beet greens and a gentler lettuce, such as butter lettuce or regular romaine, in this recipe. Beet greens are very rich in calcium as well as many other minerals and vitamins! Let this raw vegan beet green salad recipe be the start of a lovely new trend in your salad making experience. First, place the beet greens in a mixing bowl together with the fresh basil and parsley, and gently toss to combine. Next, prepare the dressing. In a small bowl, whisk together the olive oil, balsamic vinegar, garlic, mustard, nama shoyu, and agave nectar until well combined. I also like to place everything in a mason jar and shake it all up to combine well. Once your dressing is prepared, pour the dressing over the greens and gently toss until all of the greens are evenly coated. Serve your dressed beet greens topped with the tomato, cucumber and olives. Recipe tip: Want to add even more flavor and texture to your beet green salad? Here's a few raw vegan salad ingredients you might want to add it: shredded beets (try using a cheese grater for thin raw beet shreds), a handful of sunflower seeds or hemp nuts, or a handful of sprouts.